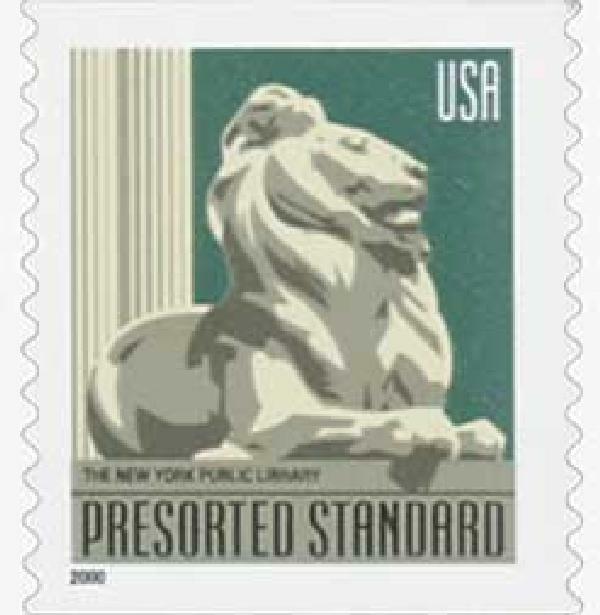 US #3447 – The library’s two lion statues are named Patience and Fortitude. 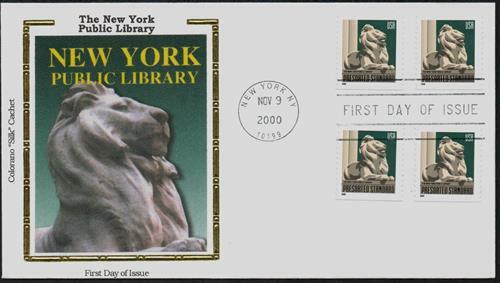 On May 23, 1895, the New York Public Library was established. Exactly 16 years later, on May 23, 1911, the main branch of the library opened its doors to the public. At the suggestion of friend and librarian Joseph Cogswell, businessman John Jacob Astor included a donation of $400,000 in his will to be used to start a public library. After his death in 1848, a board of trustees founded the Astor Library, which opened in the East Village of New York City in 1854. 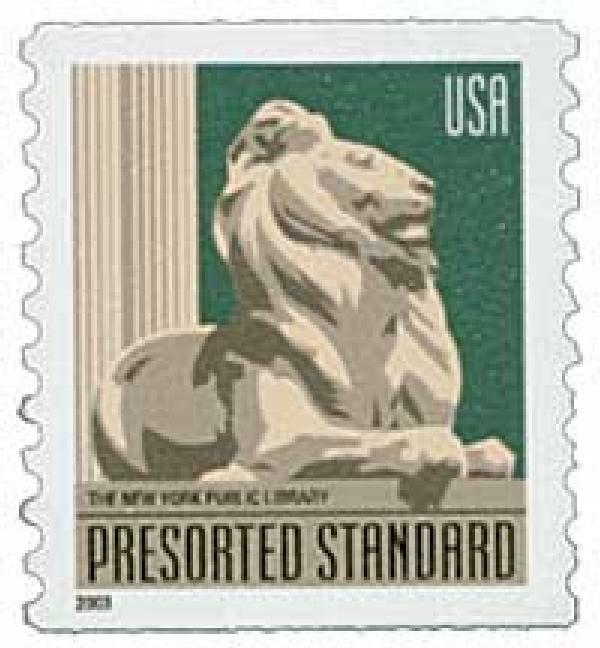 US #3769 is a water-activated gum version of the self-adhesive stamp above. Two years earlier, the Lenox Library had been incorporated. Founded by philanthropist James Lenox, it housed a large collection of America history, art, manuscripts, and rare books, including the first Gutenberg Bible in America. However, the Lenox Library charged admission and didn’t allow people to check out books either. A major stepping-stone came in 1886, when the former governor of New York, Samuel J. Tilden died and left the majority of his fortune – about $2.4 million – to “establish and maintain a free library and reading room in the city of New York.” The funds sat unused for several years until two trustees had the idea to merge the Astor and Lenox libraries. Both libraries were struggling at the time, and though the city had several libraries, most were privately funded and charged admission and usage fees. 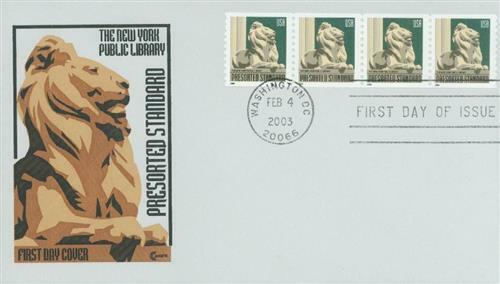 US #3447 – Classic First Day Cover. The two trustees got the owners of both libraries to agree to the idea and on May 23, 1895, created the New York Public Library, Astor, Lenox and Tilden Foundations. In 1901, Andrew Carnegie agreed to donate $5.2 million to help pay for the construction of 65 branches throughout New York City. Among these would be the central main branch, located on Fifth Avenue. The cornerstone was laid in May 1902 and in 1910, 75 miles of shelves were installed. It then took a year to move all the books from the Astor and Lenox libraries. US #3447 – Silk Cachet First Day Cover. The main branch opened on May 23, 1911, exactly 16 years after the library had been founded. President William Howard Taft presided over the dedication ceremony, which was attended by 50,000 people. The library contained over 1 million books and was the largest marble building up to that time. Its main reading room was also the largest at the time. In 1965, the building was declared a National Historic Landmark. In the 1980s, the library’s collection had grown so large, the building was expanded by 125,000 square feet with new facilities below Bryant Park. 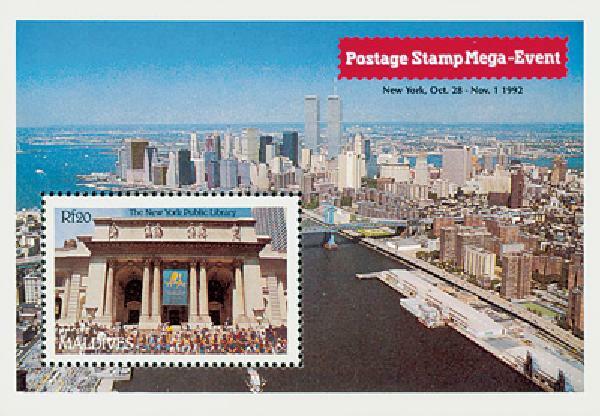 US #3769 – Classic First Day Cover. Today, the New York Public Library is the second largest public library in the country (behind the Library of Congress) and the fourth largest in the world. It houses 53 million items across 92 locations. In addition to books, manuscripts, pictures, maps, film, microfilm, braille books and recordings, the library also offers lectures, concerts, movies, discussions, and children’s story hours. Item #M7157 pictures the New York Public Library. This entry was posted in May 2018, This Day in History. Bookmark the permalink. 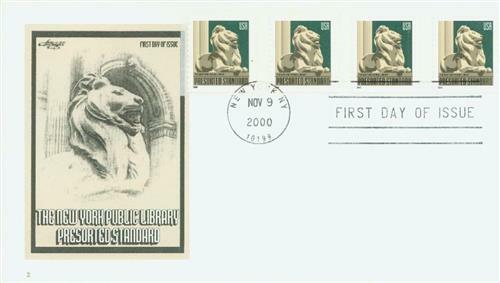 2 Responses to "This Day in History… May 23, 1895"
Free public libraries…books…reading. Sadly, they are going out of style in many quarters. If you walk into the library at our local high school (oops, “Media Center”), you will see rows and rows of books quietly gathering dust on the shelves while the students are hunched over computers. In the elementary grades, the students read books all the time, but by the time they get to high school, for most students, if it isn’t on a screen, they aren’t too interested. Could not agree more Conrad. The habit of reading from a book is sadly dying, visiting a library is almost dead. E-books are great, but the sheer joy of physically turning a page, using a bookmark, etc., cannot be replicated.